Outhalf Billy Burns insists Ulster will be going to Dublin to give Leinster a real crack when they sides meet in the quarter-finals of the European Champions Cup at the Aviva Stadium (5:45pm) on Saturday. Ulster are underdogs for the game against the defending champions Leinster, who have been one of the most consistent sides in Europe and domestically in recent years. However, while Burns respects what is facing an Ulster side who for some have punched above their weight this season, he believes they are more than capable of getting a job done. This time last year Ulster were in danger of not making the play-offs, but they turned their season around and although they missed automatic qualification to Europe, they won a play-off against Ospreys to maintain their record of having played continually in the competition. The Province they produced some quality displays in the pool stages and won five from six games against Racing 92, Scarlets and Leicester Tigers. They finished runners-up to Racing 92 - last year’s beaten finalists - and qualified for the last eight for the first time since 2014 as the best of the three runners-up across the five groups. “I don’t think many people gave us a chance of getting out of our group - we have put in some pretty impressive displays this season against some tough opposition and we know this game is going to take our best performance yet for sure,” said Burns. “We have grown and improved as the season has gone on and feel more than capable of getting the job done. Some people saw this as a transitionary year for us but we have never seen it that way. “Leinster have been the best team in Europe for the last number of years and it’s going to be a huge challenge for us but we back ourselves. Burns joined Ulster from Gloucester last summer and the flyhalf will be experiencing Champions Cup knockout rugby for the first time in Dublin. “I did it in the Challenge Cup. I think it’s just the excitement of knowing you’ve just got one shot, to go down there there’s no replay or anything like that. “It’s winner takes all so it’s just getting that excitement, getting everyone driven towards doing what you can to prepare well and going out on the pitch and do your thing so we’re hugely excited. “There’s a lot of boys who are experienced, they’ve stepped up to the challenges so far and I’m sure they’ll step up again on Saturday,” added Burns. In terms of what a European Champions Cup week does around the Province Burns said it brought about a huge buzz. As for playing against Leinster, Burns said it was important to keep the basics right. “There’s no hiding the quality of these guys, they’ve been the best team in Europe for a number of years now and without those basics you’re not going to stand much of a chance so set-piece is going to have to function well for us. “We’ll have to play well in the right areas of the park, discipline again is going to be massive, if you give those boys field position, they’re pretty dangerous. “I think it’s just getting all those basic parts right. Obviously it’s a big occasion, not letting that occasion get to us and just going down there, we’ve got a good brand (of rugby) in place, just getting the job done. Ulster will have their Irish internationals returning to the side, with Iain Henderson expected to get the all clear ahead of the team announcement at lunchtime today, and captain Rory Best and winger Jacob Stockdale both fully rested from the Six Nations championship. “Those guys are always in and around the club even when they’re in camps and stuff so it is easy when they fit back in,” said Burns. “They’re all great professionals and they come back and fit in straight away. “Probably, if anything they give a little bit of a lift to the boys as well. “Obviously at this stage of the season, there are a few battered and bruised bodies but they come in and sort of energise everyone again, gives us a boost to go on. “But we don’t need a boost to get up for this game but it’s definitely nice to have those guys back in and having their experience this weekend and playing in big games and playing at the Aviva is something that some of the younger boys who haven’t had that experience will be really picking their brains for. “It’s been positive and they’ve come in pretty seamlessly,” added Burns. This will be the first time Burns will have played against Ireland - and arguably one of the world’s best - outhalves in Johnny Sexton. “It is hugely excited,” said Burns. “I’ve been watching a lot of his game this week and over the past few years obviously. “He’s been probably the best flyhalf and player in my position and I have tried to learn as much as I can from just watching his games. Sexton received some criticism for his performances during the Six Nations Championship - Ireland finishing third having achieved the Grand Slam last season - but Burns was not being drawn into a conversation on that. “Oh, I don’t think it’s for me to say how he played in the Six Nations,” Burns said. 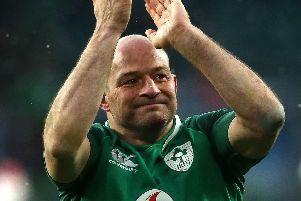 “He’s showed that he is a world-class player and I know it didn’t all his way in the Six Nations but there’s no doubt that he’ll be on form this weekend. While Sexton has been the subject of some targeting by teams, Burns said while Ulster would be not be going out to target the Irish and Leinster outhalf, halfbacks tended to be the centre of attention anyway. “Nowadays you go into games most trying to get at the half backs, they tend to sort of run the attacking side of teams so it’s no different,” he said. “It’s just the added emphasis this weekend that it’s Johnny Sexton who’s probably the best in the world, like I keep saying. “Yeah, that will be part of the plan but it’s part of plan every week. There’s a lot more people than Johnny Sexton that we have to worry about, they’ve got great players all over the park and we’ll have to watch them all,” added the Ulster halfback.